Welcome to Where Jess Ate! 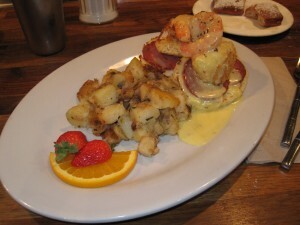 I thought I’d make my first post about a place that has become my favourite brunch spot in the city – Stockyards. This restaurant is just west of St. Clair and Christie, and while I wish it was right on the subway line, my waistline may beg to differ! Mike and I first discovered this place last July long weekend when we were in the area. I had remembered reading positive reviews about Stockyards, so we decided to give it a try. After our initial visit, we were in love (with the food) and returned many times for brunch. Stockyards is extremely tiny, seating approximately 20 people, so I wouldn’t recommend coming with more than one other person, otherwise you could be waiting for a while. In addition, the seating is all along the counter so it’s not the greatest place to have a nice conversation with many dining companions. 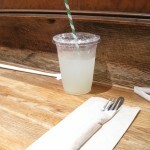 They’re also a popular take-out destination if you’re located nearby. Whenever we come to Stockyards for brunch, we start out with the Daily Beignets ($6) which are filled with dulce de lece in the middle and covered with powdered sugar on top. Be warned – they come extremely hot, as they’re fresh out of the fryer. I learned that the hard way when I eagerly bit into one and ended up coughing from the heat, blowing the powdered sugar all over myself! 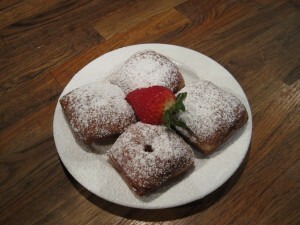 A serving comes with four beignets and is definitely a must-try. 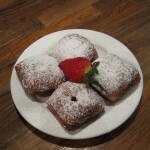 I’m always a sucker for fresh donuts/beignets! They also do a bacon-dipped donut; we’ve seen it a few times, but we still have yet to try it, which is surprising, given Mike’s love for bacon. 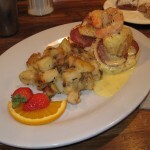 My other go-to is the Eggs Tommy – deep fried poached eggs with house cured andouille, butter poached shrimp, on buttermilk biscuits smothered with hollandaise ($13). Whether you like eggs benny or not, this is a must try! Hands down, the best (and most indulgent) eggs benny I’ve ever had! The deep fried poached eggs are crispy on the outside and perfectly runny in the middle. There’s nothing I hate more than poking into a poached egg, only to find the yolk fully cooked. The house-made sausage was extremely tasty and the shrimp added that extra bit of oomph to the dish. One of my favourite parts of the Eggs Tommy, however, is definitely the buttermilk biscuit that the toppings are served on. These bad boys are super buttery and are the perfect vehicle for the eggs benny. Watching them top the entire concoction with the hollandaise (and they’re very generous with it! ), makes my mouth water every time. Absolute perfection! My only complaint about this dish is the home fries, which certainly look better than they taste! I found them to be rather underseasoned. However, with such an indulgent eggs benny, who really needs the extra carbs? 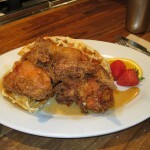 Mike often goes with thefried chicken and waffles – fried chicken over Belgian waffles with chili maple molasses citrus glaze ($12). 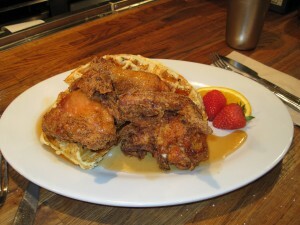 This comes with three large pieces of fried chicken on a large waffle. The fried chicken tastes absolutely amazing covered in the maple molasses citrus glaze. The skin is perfectly crispy, and the combination with the waffles is to die for. 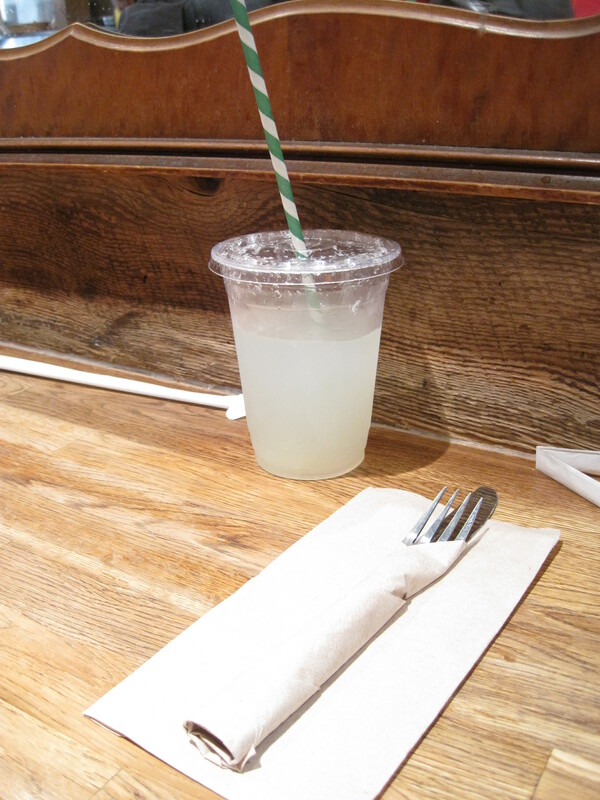 For a refreshing drink, I’d recommend their limeade – house-made infused with mint ($2.75). Not only is the food great, but the service is always friendly; you can tell that all the staff are genuinely happy to be working. Our bill normally comes to around $35 before tips/tax – not exactly a cheap brunch, but well worth it! Make sure you come hungry!